For investors and analyst it is important to read and evaluate perspectives that run counter to ones own in order to increase the likelihood they are not missing something in their analysis or thinking. For example, the equity market has essentially moved higher, uninterrupted, since the end of the financial crisis low in 2009 and the bull market seems to want to continue; however, is there something suggesting the bull market may be nearing an end? Many of the technical aspects of the market support an additional move higher though and just one bullish chart is noted below. Charles Kirk, author of The Kirk Report, was recently asked if there is a market technical pattern that runs counter to the many bullish chart patterns currently in play for the market. 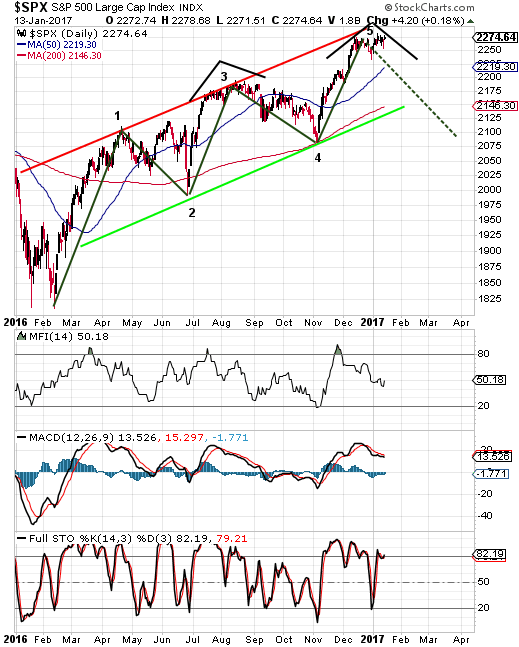 Kirk provides good weekly technical commentary in his subscriber report each week. In this week's subscriber report, he included a chart similar to the one below. The chart shows a Fifth Wave exhaustion pattern and a potential bearish head & shoulders pattern developing. Much of the current technical market action does remain bullish. From a fundamental perspective, earnings and economic reports are also exhibiting an improving trend. In spite of the broad number of bullish indicators, reviewing potential negative signals that might run counter to ones own views can provide insight into potential market turning points.